Like many dog owners, much of my schedule is dictated by my dogs, so I’m always looking for new places to go, events to participate in, and things to do that’ll be entertaining for me and my canine companions. 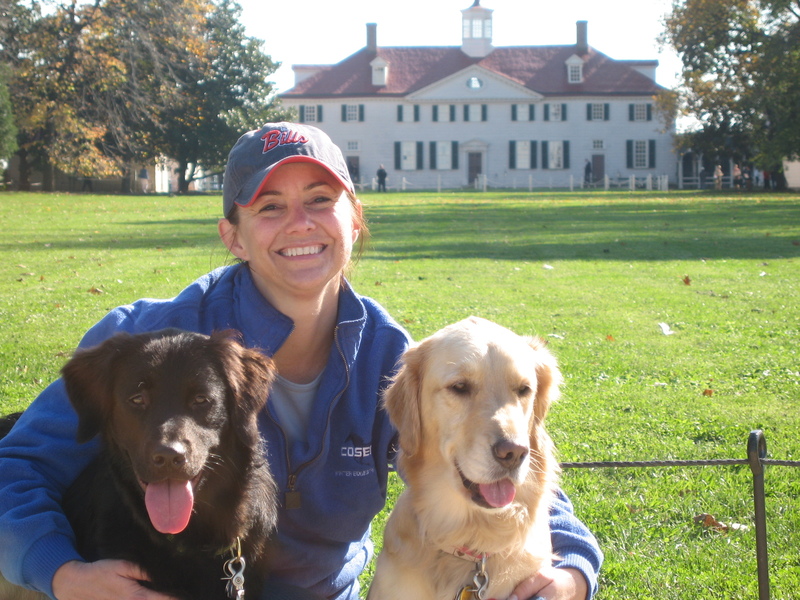 Having lived in Northern Virginia for 20 years I’ve connected with lots of like-minded dog owners, so this blog is a way to share our experiences–as well as dog news and other information of interest–so other dog owners can enjoy them, too! So please join my Golden Retriever Chatham and shelter mutt Sundae who is rumored to be a Golden-Lab mix but apparently also has a healthy dose of Border Collie (and Chatham will attest is 100 percent bratty little sister), as we live, laugh and love this life with dogs! I love your blog, Gwyn. And your two pups are beautiful. I want to get another golden retriever one day (my dear departed Folly will be a tough act to follow). Maybe a golden rescue organization. Taylor, it was great to meet you and your family, too! What a neat experience touring the Southeast Guide Dog School in Palmetto, Fla., and I can’t wait to get your pictures and write a blog post about it!